Many thanks for a great job on our EL Falcon. For an insight into the capabilities of paintless dent removal here are a few of our most common FAQs. If you have any further questions please do not hesitate to call or email us. The origins of PDR are said to go back to the assembly lines of the Mercedes and BMW plants in Germany dating back over 60 years! In more recent times the manufacture of professional tools and equipment has brought PDR to the forefront of vehicle repair. 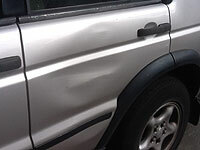 PDR is a skilled process that enables us to remove dents, dings and other body damage. With no spraying involved this environmentally friendly technique restores your vehicle to its original condition without the use of paint and body fillers traditionally used by panel shops. How does the PDR process work? Dent Devils use specialised steel rods and leavers behind the dent to release pressure inside the damaged area allowing the panel to revert to its original shape. Depending on the repair the dent is accessed by removing trim pieces, through window openings or by removing inner panels. It is a skilled process and our experienced technicians can achieve showroom results. 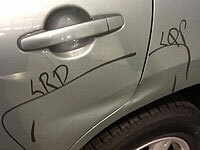 PDR does not conceal the damage; it completely removes it preserving the original paint finish on your vehicle. PDR is a relatively quick, affordable alternative to costly and time-consuming panel shop repairs. The technology and skills of an experienced technician are second to none in the repair industry. This environmentally friendly technique requires no filling, priming or painting. The original factory paint finish is left untarnished retaining the original condition. Dent Devils are a mobile service - we come to you. Dent Devils save you time, money and retain your vehicles value! Dent Devils can repair most non-collision dents from the size of a ten cent piece to the size of a soccer ball. The determining factor is the dents depth and diameter. A large shallow dent is more repairable than a small extremely sharp dent. What types of dents cannot be repaired using PDR? 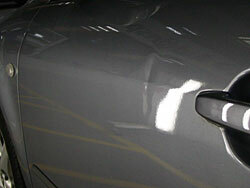 Dent Devils can repair most non-collision dents and creases where the paintwork has not cracked. Some exceptions are sharp deep dents where the metal has been stretched too far to recover. 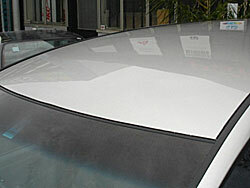 Dents that are located near the very edge or seam of a panel making it difficult to access the dent for repair. See three examples below. What about body line dents? Yes, not a problem. 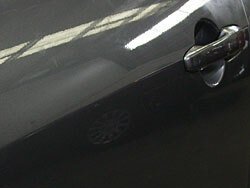 Body line dents can also be removed they just take a little more time to complete. Someone walked on my roof - can you fix it? Yes, we can. Our experienced technicians have the ability to remove complex dents, which can be difficult to reach and time consuming, and leave you to think there is no other option but a costly traditional repair. And scratches - what about those? Sorry, but no we don't. 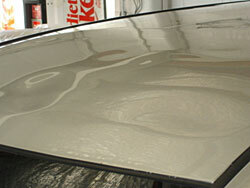 If your vehicle needs paint work we are happy to refer you to quality panel shops.